Shop Online Catalog to the left for the items you need. 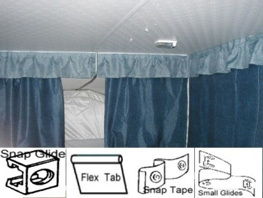 Pop up Camper Canvas Replacements Sale! Custom Size Cushion Covers. Sale! ShadeMaker Classic Bag Awning Sale! Canvas replacement for all pop up camper models. If you can't find yours Email us for a quote. We need your year make, model, and VIN#. Canvas Sale $25 off with Discount Shipping. Order early. Our tree is different. We think it's a bit better! Cushion covers made to to fit. Gaucho, Dinette and Mattress. 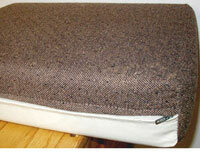 We need the size of the foam block in inches to make a zip on cover in beautiful upholstery material. 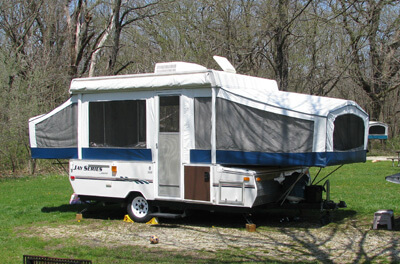 ShadeMaker awnings for Pop up campers are USA made bag type awnings. Shipping is free from Chicago to the lower 48 states! Curtains are sewn in our professional sew shop! Each curtain panel is 52'' H x 54'' W sold in pairs, covers over 8', and is available with several attachment options. Socket Jenie - Stop Cranking. REPLACE THE CRANK! Use a battery operated drill or screw driver with a socket jenie. The quick way to lower or raise you jacks or Pop up Camper.